↑ Hoffman, Louw; Schalkwyk, Sunet van; Muller, Nina (2009). 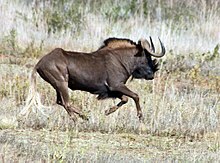 "Effect of Season and Gender on the Physical and Chemical Composition of Black Wildebeest (Connochaetus Gnou) Meat". South African Journal of Wildlife Research. 39 (2): 170–174. डीओआइ:10.3957/056.039.0208. ↑ Osthoff, G.; A. Hugo, M. de Wit (2009). "Comparison of the Milk Composition of Free-ranging Blesbok, Black Wildebeest and Blue Wildebeest of the Subfamily Alcelaphinae (family: Bovidae)". Comparative Biochemistry and Physiology Part B: Biochemistry and Molecular Biology. 154 (1): 48–54. डीओआइ:10.1016/j.cbpb.2009.04.015.